BOLD-CAPITAL means that this service has a primary status, in this case the Maritime mobile service. 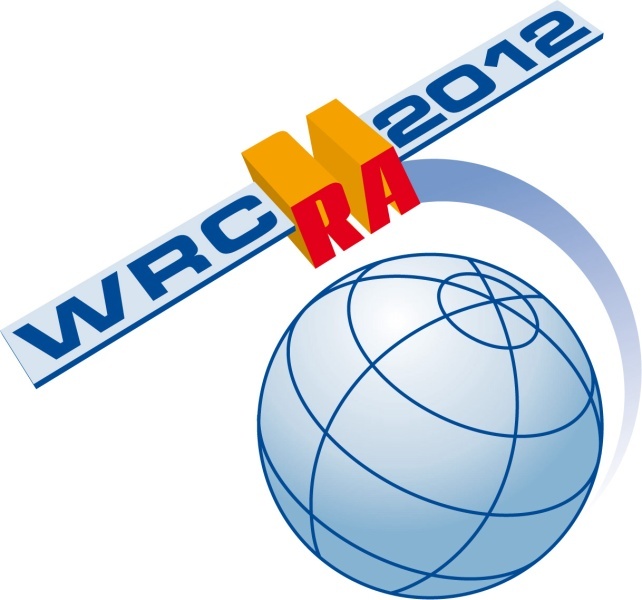 Footnote 5.77 gives the Aeronautical navigation service also a primary status in Armenia, Australia, Azerbaijan, Belarus, China, the French overseas communities of Region 3, Kazakhstan, India, Iran, Japan, Pakistan, Papua New Guinea, the Russian Federation, Sri Lanka, South-Korea, Uzbekistan and Kyrgyzstan. Footnote 5.82 protects the Maritime mobile service on 490 kHz (NAVTEX): In using the frequency band 472-479 kHz for the Amateur service, administrations shall ensure that no harmful interference is caused to the frequency 490 kHz. Footnote 5.A123 defines the conditions for the Amateur service: The maximum equivalent isotropically radiated power (e.i.r.p.) of stations in the amateur service using frequencies in the band 472-479 kHz shall not exceed 1 W. Administrations may increase this limit of e.i.r.p. to 5 W in portions of their territory which are at a distance of over 800 km from the borders of Algeria, Saudi Arabia, Azerbaijan, Bahrain, Belarus, China, Comoros, Djibouti, Egypt, United Arab Emirates, the Russian Federation, Iran (Islamic Republic of), Iraq, Jordan, Kazakhstan, Kuwait, Lebanon, Libya, Morocco, Mauritania, Oman, Uzbekistan, Qatar, Syrian Arab Republic, Kyrgyzstan, Somalia, Sudan, Tunisia, Ukraine and Yemen. In this frequency band, stations in the amateur service shall not cause harmful interference to, or claim protection from, stations of the aeronautical radionavigation service. 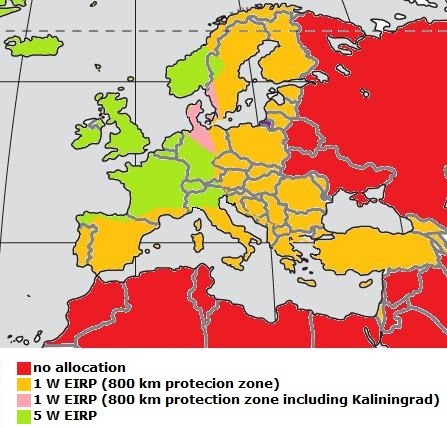 The map below shows the European 800 km protection zones as mentioned in footnote 5.A123. But be aware that access to the 472-479 kHz segment and the E(I)RP that can be used depends on national regulations and can differ from what is shown on this map. An overview of countries that have access to the 472-479 kHz segment can be found here. Footnote 5.B123 prohibits the access to the Amateur service of this frequency segment a number of countries: The use of the frequency band 472-479 kHz in Algeria, Saudi Arabia, Azerbaijan, Bahrain, Belarus, China, Comoros, Djibouti, Egypt, United Arab Emirates, the Russian Federation, Iraq, Jordan, Kazakhstan, Kuwait, Lebanon, Libya, Mauritania, Oman, Uzbekistan, Qatar, Syrian Arab Republic, Kyrgyzstan, Somalia, Sudan, Tunisia and Yemen is limited to the maritime mobile and aeronautical radionavigation services. The amateur service shall not be used in the above mentioned countries in this frequency band, and this should be taken into account by the countries authorising such use.